The other day I was talking with Raju, an unemployed Bangladeshi with a graduate degree in Pharmacy. After graduating from a private university, he briefly worked as a lecturer for a college. Although he was teaching three days in a week he was required to be present there every weekday. The salary was low but hours he had to spend at the college were long, not counting, of course, the awful commuting hours. So, he volunteered to leave his job. I can’t blame him for his decision. 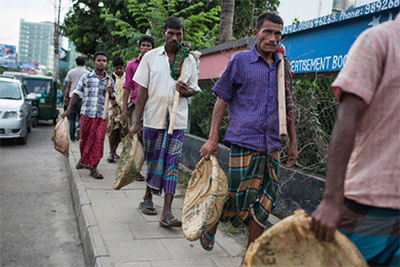 I am told that on an average approximately 1.7 million hours are lost every day by commuters to and from work in Chittagong, the second largest city in Bangladesh. With a population of nearly 8 million people and with horrendous gridlocks on all the major arteries in the city, moving from one part to another part of the city is very time-consuming. The situation is worse in Dhaka, the capital city, where on an average nearly 3.2 million hours are lost every day by commuters. The average commuter speed has reduced from 21 to 7 kilometers per hour in the last ten years, which is only a couple of kilometers higher than the walking speed of an adult. The Dhaka metropolitan area is forecasted to have an estimated 30 million people living by the next decade. Unless a well-thought out program is planned and meticulously implemented for expanding the major cities like Dhaka with appropriate infrastructure development it would be a nightmare for the residents commuting between places. When I asked Raju if he had been applying for jobs, he answered in the affirmative but said that there is so much competition for jobs that it is very difficult to land a job without bribing hiring officials. Almost all jobs now require a massive application fee, which runs into thousands of Taka (1 US dollar is approx..80 Taka). For a government job he had applied, there were 60,000 applicants, of which only 98 passed the test and were asked to appear for their interview. He is one of those who passed the written test. However, since only six persons would be hired he sees no chance of getting the job unless a hefty bribe is paid on his behalf. Naturally, I was surprised to hear the depth of corruption in the government employment sector. Compounding the problem is a very controversial quota system in which nearly one-third of job quota is fixed for family members of freedom-fighters who had participated in Bangladesh’s liberation war. A sixth of the job quota is fixed for minorities, physically handicapped individuals, etc., thus, effectively limiting the opportunity for an ordinary applicant – who form most applicants - to the remainder 50% of the positions. In recent weeks this highly discriminatory quota system has seen much demonstrations and protest marches in many parts of the country forcing the Prime Minister to say that she would prefer its abolishment. However, members of the ruling party and its student affiliates have been major beneficiaries of the quota system, and they are opposed to any change, and have often beaten up peaceful demonstrators demanding a change of the quota system. 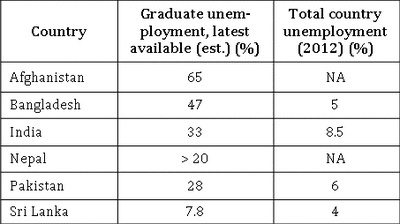 I am told that with some 19.6 million adults unemployed, Bangladesh has a phenomenal 48% unemployment rate within the educated group with college and university degrees. This explains how a hiring company can make tons of money by posting an ad in the newspaper. The salary offered to these newly graduates is rather pitiful. The other day, I was speaking with a woman whose daughter had returned from India after completing a 4-year cost management bachelor’s degree program from a prestigious institute. Her daughter was offered a salary of only Tk. 3500 per month (approx. 40 USD) by a private company. This is painful to most parents when they see that their children are offered such a low-paying job in the private sector while they had spent more than a quarter million taka for their college/university education. Even the uneducated cleaning ladies and house servants make more money than these educated new hires! Interestingly, Mr. Barua is the leader of a communist party, Samyabadi Dal. In olden days, people in Bangladesh would entertain very positive impression about the sincerity and honesty of communist minded party members and leaders. It did not take too long, however, to find out that they are worse than non-communists. So, Raju’s experience with Mr. Barua did not surprise me. I wish the latter had lived up to the moral preached by the communist leaders than enriching themselves with the filthy money from the job-seekers. These days, since 1971, people in Bangladesh are not fooled by these greedy and immoral communists when they saw firsthand how corrupt they were. As a result, the only reason people like Mr. Barua were chosen to serve as ministers was because of being part of a coalition government with the major ruling party as a minority coalition member; on their own, they could not win a single electoral seat in the parliament. These fake communists have failed to live by the dictates of communism and have made a mockery of the once much popular ideology in much of the third world countries, which explains why outside China and Cuba communism is a stinking carcass.